In mid-2016 I bought a book that would change the way I looked at marketing forever. Like many bloggers and product makers I had stumbled my way through marketing my wares from the beginning (some 10 years previous), never really understanding what to say, or how to say it when it came to advertising. I didn’t have a clue, or a plan and I didn’t know what my customers wanted to hear. I thought I just had to shout the loudest to be heard originally. And any time I succeeded in selling I thought it was through a mixture of luck and dog-eared determination. 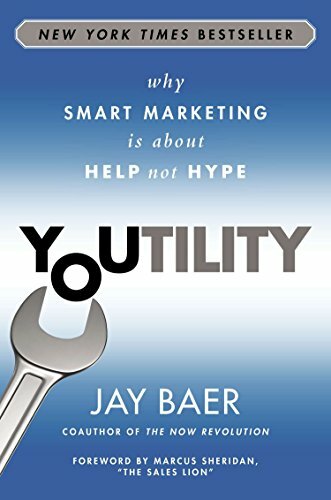 So fast forward to July/August last year and I bought a book on Amazon, called Youtility: Why Smart Marketing is About Help not Hype by Jay Baer (published 2013)*. I started reading it and it was like BAM! Here was the answer I was looking for all along. I revisited my favourite blogs and social streams and right there I could clearly see the most successful marketers in my product niche were creating valuable help in their blog and social content. What is Value in this case? Value is a perceived point of helpfulness to your reader/potential customer, in which the reader’s ‘struggle’ is answered through focused and varied information content (written, filmed, or otherwise). The premise extends from websites, to blogs and social feeds… anywhere your reader/potential customer can digest information. Being more focused and serving a niche is usually more successful at giving value, because it’s clear to readers what your subject matter is and that you focus on providing information about a given subject. Readers are therefore more likely to stick around if they resonate with your message. I had to immediately go back and look at my own offer. It wasn’t all bad I had created some really important value for my readers, but I hadn’t been consistent or even logical in my efforts. I knew I had to change this when I started My Indie Life Blog. So I started planning from what I was learning. Turning marketing upside down - focusing on how we can raise awareness in modern social media, by how customers may think to remember us by. The three facets of Youtility - self-service, radical transparency and real-time relevancy. Six blueprints to create Youtility - identifying customer needs, map customer needs, market your marketing, insource Youtility, make Youtility a process, not a project and keeping score. Increase awareness – I should be telling my customers that I am here to help answer a very specific problem they have. Show I was an expert – that I am an expert in solving their problem. Turn sceptics into followers – show that I am approachable and valuable to have show up in their feed every day. S.M.A.R.T. Goal – Create a marketing message for My Indie Life Blog by end Q1. Plan content for the launch, with basic introduction to what I do, evergreen useful blog posts and ask as many social questions as possible along the way for future content ideas. Plan a content calendar – consistency is key. Set up social scheduling - you can see some of my tools here. Goals should be ever evolving, so know that this starting goal is not the end. Once you have completed it, you should set another. You can do this too and honestly it’s much easier than you think. Firstly I recommend getting a copy of the book and devouring every sentence. Then, start by creating your own Marketing Message Plan.